Want to submit an application for a ChemClub Community Activity Grant before June 1, but don’t have a project idea? Or, is your Club simply looking for something new to try? Why not turn STEM into STEAM? Fusion Science Theater (FST) takes Science, Technology, Engineering, and Mathematics education to a new creative level by adding the Arts. The Fusion Science Theater website describes FST as a STEAM outreach program that uses the secrets of theater to create outreach shows that actively engage children in learning science. They’re short, interactive shows that weave demonstrations together with predictions, modeling, and a storyline, targeted for an audience of grades 1 through 5. How can you bring this program to your area? Apply for a Community Activity Grant to purchase a FST show performance kit! The kit will give your Club everything they need to perform the show in your community. The kits include a show script, video of a live performance of the show, list of materials and props you’ll need, a handbook for training and performance tips, and even instructions on how to assess learning achieved during the show. If I Were an Atom to explore kinetic molecular theory and how atoms move in the solid phase. Watch a video preview. Bouncemania! with a “Wrestlemania”-style match between happy & sad toy balls to learn about polymers and molecular structure. Who will be crowned “The World’s Bounciest Ball”? Watch a video preview. Will It Light? to test and model the flow of electricity through different substances, as students investigate conductivity. Watch a video preview. FST shows are more than just sharing your typical demos. They are inquiry-based. 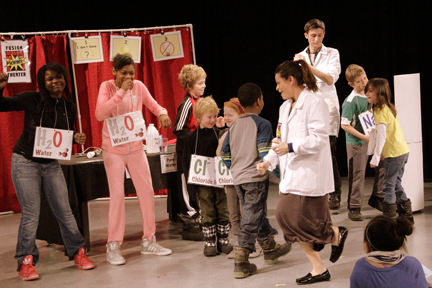 Show characters lead students to investigate a question that motivates the audience to learn a basic chemical concept. The shows are highly interactive. Audience members get to assist on stage, vote for their prediction of what will happen in a demonstration, and more. It’s easy to measure the impact and learning using assessment info included in the kit. The theater techniques and elements used are a great way to keep your audience’s attention. For more information, download a PDF of the FST flier that was also included in a recent ACS ChemClub resource packet. Get out there and generate some STEAM!